A history of the Samurai must begin with the most important aspect of a Samurai: Bushido. Knowing about Bushido is how one knows the Samurai warrior. "Bushi" is translated as "Warrior" and "do" is translated as "the way." Thus Bushido means "the Samurai way of life." Bushido consisted of a rigid code of ethics that was to be followed devoutly with bravery, honor and loyalty as the most important aspects. The most revered Bushido tenet was "freedom from fear." A Samurai was to live every moment with no fear of death, thus giving them the freedom to follow the Bushido code without hesitation and without fail. This philosophy was to be held sacred, even if one had to sacrifice one's life to pursue these ideals. The Samurai culture rose from the ongoing wars over land among the Minamoto, Fujiwara and Taira clans. Though the Samurai originated from regional groups of ancient warriors, they quickly lost their provincial ways. They developed a unique, sophisticated culture that was renowned for stoicism, honor and military expertise during the Kamakura period (1192-1333). During the Muromachi period (1338-1573), Samurai culture created the idea of artist-warrior. Samurai training began to include the ritualized tea ceremony and flower arranging to add refinement and balance to the warrior persona. The code of Bushido became formalized. 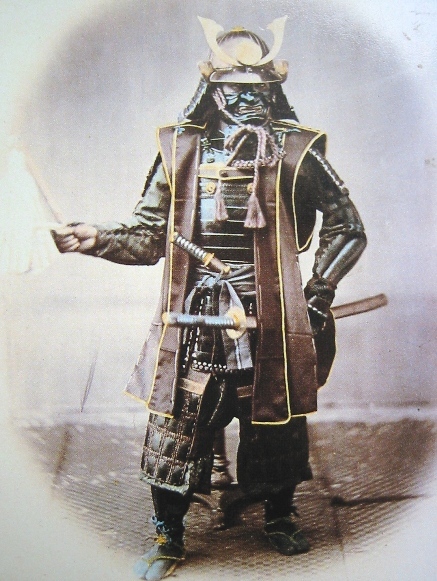 The Samurai were considered the aristocratic warrior class of Japan. The peak of the Samurai era was in 12th century Japan where they enjoyed the benefits of belonging to a unique, privileged class. The Samurai were able to wear their swords freely and had the right to kill any peasant who offended them. The downfall of the Samurai began during the Edo period (1603-1867). Two hundred and fifty years of peace had made the Samurai archaic: they were allowed to wear their swords, but had to accept non-warrior jobs to survive. The booming economy during this time of peace further excluded the ascetic principles of the Samurai, as most Japanese citizens were enjoying the new luxuries that accompany economic prosperity. The gradual decline of the Samurai continued until the last Shogun resigned during the Meiji Restoration in 1868. Dissatisfied Samurai had led the revolt against the shogun, but the new government abolished feudalism and betrayed the Samurai by stripping them of all their privileges in 1871. Thus ended the era of the Samurai. The Samurai's weapon was yet another important aspect of his life, most notably their Katana sword; although, the Samurai wore two swords, a wakizashi and a katana. Their swords were made by master sword smiths and quality tested on the corpses of criminals. The length of a Samurai sword has varied over time, but the modern version is typically around 40 inches overall with a 28 inch blade. The forging of a genuine Samurai sword is a tedious, labor-intensive process that begins with a specialized Japanese steel called "tamahagane." Through this smelting process, a steel is produced that consists of a carbon count that is balanced throughout the steel making it the optimal steel for fashioning a sword. Master Swordsmiths then begin the process of folding the steel begins and can be folded up to 16 times. This process helps to remove any remaining impurities, while also creating alternating layers that greatly increase the toughness and durability of the blade. The Samurai's katana was his primary weapon of self-defense, but he also carried a wakizashi sword. It typically boasted a 20 inch blade with a 4 inch tsuka (handle.) When worn with the Japanese katana, the pair is then referred to as daisho. The Samurai often used his wakizashi in close quarter combat situations and even during ceremonial, ritual suicide if the warrior had broken one of the 7 virtues of bushido. The photo to the right shows a Samurai wearing his daisho. The elite Samurai warrior trained for many years in the art "Bujutsu." The Samurai were experts in a wide variety of combat skills including ground fighting, fighting unarmed, fighting with arms and fighting from horseback. Early Samurai used bow and arrows, and swords. Later Samurai used swords, spears and naginata (halberds.) 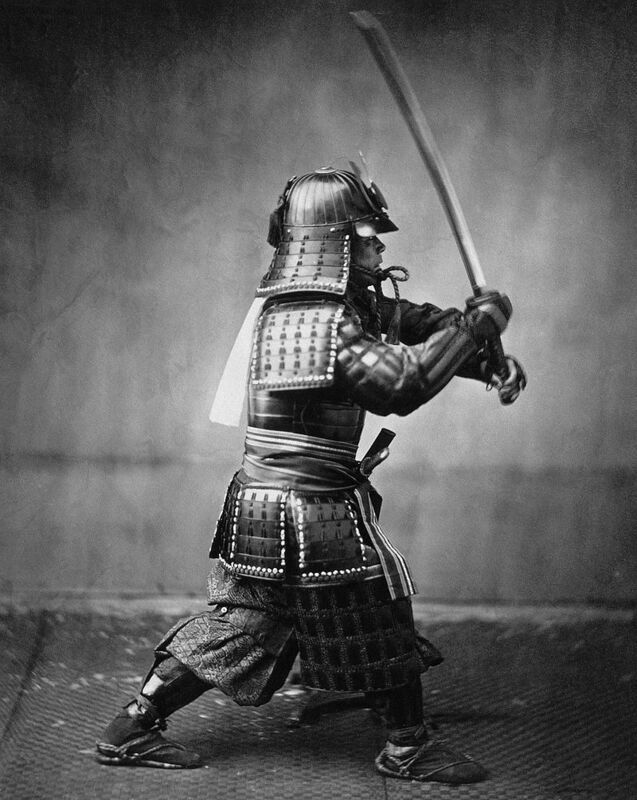 Samurai often named their swords, in a dedication of devotion. They believed that their warrior spirit was contained within their swords. They dedicated their lives to the combat arts of Bujutsu. The history and philosophy of the Samurai lives on in the form of the Samurai sword, which has become a much sought after symbol of this historic and heroic bygone era. 1185 - 1332 when the capital of Japan was in Kamakura. Known as the "golden age" of the Japanese sword. 1573 - 1599 when Samurai began wearing daisho. Also beginning of the Shinto (new sword) period. Muromachi Period - 1392 - 1572 when constant civil wars greatly increased the production of swords.